CP 80967 is a simple study in very minor paint and decal tweaks to update the appearance of a (basically) RTR car. The subject is a factory decorated model originally produced by Life Like under the Proto1000 brand label. (This tooling is now owned by Walthers.) It’s basically Ready to Run, other than the ladders and door rods being modeler-applied parts although they don’t really take any special skill to install. One thing about the model is the colour of the roof. The roof is factory painted a pale grey colour to represent a bare galvanized steel roof, but just being a flat grey fails to really “pop” properly. So to improve the car (actually a trio of cars I have in these colours) I masked off the roof and re-sprayed it with Model Master “Steel”. The overall colour is almost the same shade except the Steel actually gives it a proper metallic finish. 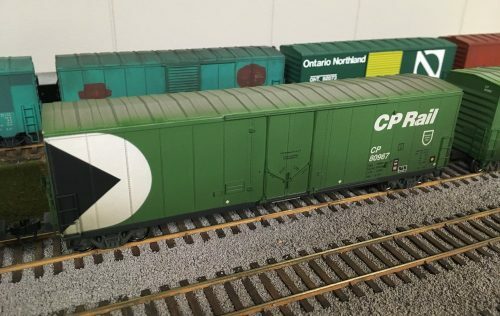 Next, as the 80967-81216 (yep, this car is actually the “class unit” for the series) were delivered in 1967 and actually originally painted in script, the Action Green MultiMark represents a repaint of these cars, and a little bit of Action Green overspray was added around the edges. Standard decal additions of COTS and U-1 stencils in varying locations on the different cars and updated weigh dates completes the standard lettering updates before weathering. PGE 4601-4642 5/67 YPD 38’10” re# BCOL 4601-4642 /72. Non-cushioned. PGE 4651-4750 4/69 YPDX 40’8″ re# BCOL 4651-4750 /72. Non-cushioned.